Many authors draw on real world inspiration for aspects of their fantasy world. George R.R. Martin, the author of A Song of Ice and Fire, is known for doing this. Many of the religions he has created draws on aspects from the religions of our world. Some of them have multiple inspirations all combined together. The faith of the Red God is one such religion; combining aspects of Zoroastrianism and Manichaeism. The faith of the Red God emerged 5,000 years before the beginning of A Song of Ice and Fire in a city called Asshai. Assai is at the end of the known world in Essos. It is shrouded in mystery because of its distance and it inhabitants use magic, discouraging people to visit. From there, the religion spread though many of the trading cities such as Volanatis, Lys and Braavos where the great temples are located. There are few temples in Westeros, like in Oldtown but are mainly for the sailors from Essos. Within the sacred texts there is a tale of a great hero that will fight against the Great Other. Azor Ahai was the chosen hero of the Lord of Light during the Long Night. He along with others defeated a great host of White Walkers and banished the darkness. He had a sword named Lightbringer that was forged over one hundred days and quenched in his wife’s blood. When he drew it, it was aflame and became a beacon of hope. The followers of the Lord of Light believe he will return and save them from a great darkness. The religion of the Lord of Light draws inspiration from Zoroastrianism and Manichaeism. Zoroastrianism originated with the prophet Zoroaster around 1,500 BCE. Through him, the god Ahura Mazda wrote seventeen hymns called the Gathas. The Gathas were gathered with other texts that outlined rituals into the text called the Avesta. The Avesta was written before the sixth century BCE. Before it being written, the rituals were known in oral culture reaching back to the time of Zoroaster. The spread of Zoroastrianism was helped by the three Persian Empires of Achaemenid ( 550-380 BCE), Parthian ( 250 BCE- 224 CE) and Sasanian ( 224-651 CE) where it was the state religion. These empires spread across the Middle East with its heart in Iran. Those who follow Zoroastrianism believe there is one god called Ahura Mazda, who created the universe and is linked with light. He is described as the “Lord of Light”, “Creator of the World”, and “the Ones who Knows”. Working with Ahura Mazda are the Yazatas, also known as the divine sparks. There are six of them that represent different features of the world like the sun, moon, earth, fire, water and wind. Opposite all this are the aspects of destruction and evil. The Daevas are described as false gods and the source of evil. They hold power over people through their actions and are the cause things such as greed, gluttony, lust, wrath, envy, envy and sloth. The reason for having aspects of evil in the world is to show that people have a choice. If everything was good, then people would have no choice in their actions. Evil is created by people when they make decisions that are harmful and are extensions of Deavas and Angra Mainyu. Zoroastrians believe that fire is a representative of Ahura Mazda in both a physical and metaphorical sense. With this, Ahura Mazda is present in the fire. They built temples to hold sacred fires that are used in rituals. The highest out of the three orders of fire is called the victory fire or Atash Bahram. It consists of sixteen different fires from varying origins like fire from a goldsmith, fire from a potter, and fire from lightening. Once each fire is collected, they are consecrated separately and then eventually combined. It is then enthroned in the temple and is never allowed to go out. Many religions have savior figures that will save humanity at the end of the world. The events that happen is called eschatology. For Zoroastrianism, Zoroaster’s third son, Shah Behram Varzavand, is the saviour. Him and his brothers are conceived after their father’s death through the use of his seed in the Lake Kansaoya. When woman baths in it she becomes pregnant. Shah Behram Varzavand, will be born with signs like stars falling and others to let the world know. He will perform a ritual for Ahura Mazda and begin the rising of the dead. With this he begins the healing of the world. The faith of the Red God is not a direct parallel to Zoroastrianism, but instead draws influence from it. There are similarities in the dualism with the forces of good and evil, the use of fire, and aspects of the eschatology. 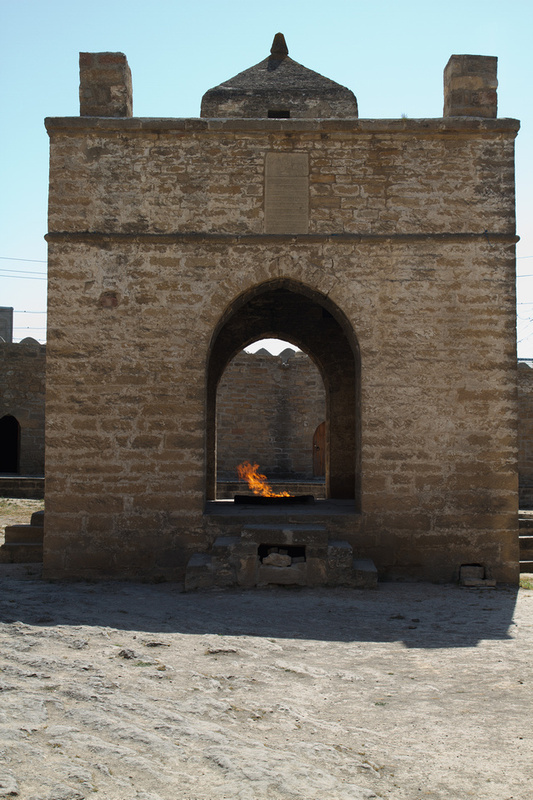 The main connection with Zoroastrianism is the use of fire which is sacred, being an extension of Ahura Mazda. 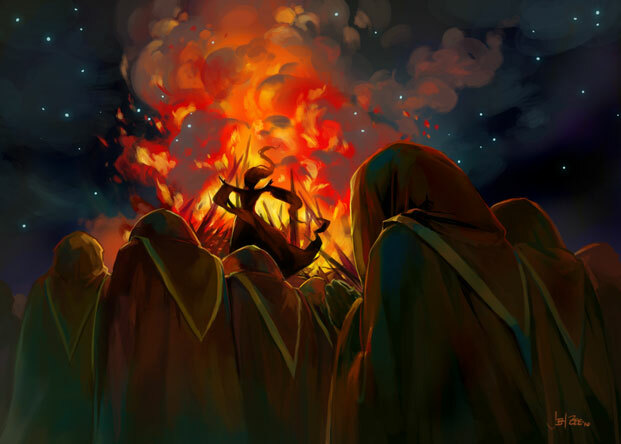 The followers of the Red God never actually state why they put such importance on fire other than it keeps the shadows away. Melisandre has a constant fire going in her room and may be a parallel to that belief and that relating to fire temples. Being a priest of the Lord of Light, they have the ability to see things in the fire. Some say this could be the voice of R’hllor guiding them from the flames and that he is part of the fire. Azor Ahai is meant to directly fight against the agents of the Great Other while Shah Behram Varzavand is meant to heal the world. One is the leader of a great battle while the other will directly help humanity. Both have nothing to say on the discussion of matter and spirit being evil or good. There are some religions that believe the material world is inherently evil and that the spiritual word is good. Zoroastrians believe what makes up good and evil is up to the individual and their choices. The other inspiration is Manichaeism. It has more parallels with respect to the dualism. Manichaeism was founded during the Sasanian Empire ( 224-651 AD) in Iran. The Prophet Mani was born in 216 AD. He composed seven writing and even presented one to the king at the time. The religion spread quickly thought the empire as the kings were religiously tolerant. Mani used many teaching from before found in Buddhism, Zoroastrianism and Christianity. He thought that many of these teachings were unfinished and elaborated on them through his works. Mani saw the spiritual world of light as good while the material world of darkness representative of evil. The light that was originally used to create the world is slowing being leached out and returning to where it came from. Eventually all material things will die. The forces involved in the dualism are The Father of Greatness, who is a not omnipotent good power and The King of Darkness who is the evil power that is semi- eternal. Building on this, Mani addresses the origin of evil. A person is both influenced by good and evil powers and they battle inside everyone. No person is intrinsically evil simply because they have a physical form. The Cathars in the Middle Ages may have drawn some of their beliefs from this. There is more of an overarching parallel with Manichaeism than with Zoroastrianism. The dualism between the Red God and the Great Other is similar to that of The Father of Greatness and The King of Darkness in Manichaeism. Both sets are equals who are in constant battle for the fate of the world. There is nothing about the importance of fire and the eschatology is simply the world dying with the souls of the dead returning to The Father of Greatness. George R.R. Martin drew aspects of the Faith of the Red God from Zoroastrianism and Manichaeism. From Zoroastrianism, he used the importance of fire and some of the eschatology. From Manichaeism, he used the dualism between good and evil to create R’llor and the Great Other. All of this combined created the Faith of the Red God. George R.R. Martin, Ellio M. Garcia, Jr., and Linda Antonsson. The World of Ice and Fire: The Untold History of Westeros and The Game of Thrones. (New York: Bantam, 2014): 308. R’hllor. A Wiki of Ice and Fire. Last modified December 14, 2014. George .R.R Martin. A Storm of Swords. (New York: Bantam, 2000): 500. The Great Other. A Wiki of Ice and Fire. Last Modified March 8, 2015. Martin, Garcia, Jr., and Antonsson. The World of Ice and Fire, 11. R’hllor. A Wiki of Ice and Fire. G.R.R. Martin, Clash of Kings. (New York: Bantam, 1999): 111. Vengrence.” Game of Thrones Lore Extra – the Lord of Light.” Youtube video. 3:39 February 17, 2014. TwoBinc. “The Zoroastrian Journey”. Youtube video. 9:19. April 30,2009. Azor Ahai. A Wiki of Ice and Fire. Last modified December 14, 2014. Martin, George R.R. A Clash of Kings. New York: Bantam, 1999. Martin, George R.R. A Dance with Dragons. New York: Bantam, 2011. Martin, George R.R. A Storm of Swords. New York: Bantam, 2000. History of Westeros and The Game of Thrones. New York, Bantam, 2014. Melisandre. A Wiki of Ice and Fire. Last Modified March 30, 2015.